Today was the Cardiff Kidney Research Wales 10k open road race. I could tell I wasn't going to win it even before I started, when I was standing in line to use the toilets. There was a bloke in front of me who was 5' 10" and about 110 lbs and had the smallest feet. I bet he wore children's shoes. And there was no fat on him, nor much muscle to be honest, just aerodynamic bone. And he was wearing a jacket, though it was about 25 celsius and warming up. I sensed the race slipping from my grasp. Did I mention that he was Kenyan? A year ago today I ran a personal best of 42:30 at this same race, despite blowing up about half way through; it was only a PB because I'd never run this distance before. 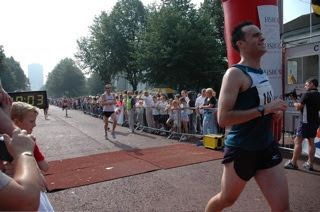 Today I managed a new PB of 39:48, which was, frankly, a slouch's effort, as you can tell from the picture below, where you can see me in the background shuffling towards the finish line and operating my stop watch, which I NEVER remember to do when I've run properly. Anyway, it was a nice day, stupidly warm, stupidly crowded at the start (why do all the slow people push their way to the starting line? Do they actually enjoy being continuously passed for the next 60 mins? ), and all in a good cause. The Kenyan was only about 11 minutes faster than me, which was less than last time. When I arrived back in Cambridge, the only interesting piece of mail awaiting me was my runners' number for the Robin Hood half-marathon in Nottingham next weekend; and no, that's not my next race, because I have a 5k on Thursday. For a moment I almost thought that this was a strange way to live. Meanwhile in Philadelphia there was a memorial service for my brother in law Tom -- you will all remember earlier postings about his circumstances -- who died eight days ago. Please spare a thought for his family.